During the next few weeks, the next steps of our development of ICT innovation are made. Firstly, we are bringing on stream 100 net books for class usage at schools and college, most of which have been provided through funds raised by our PTA committees. The model we have chose to use is the HP 100e, a robust made-for-education machine that should serve us well for 3 years or so. They come on a 24 station trolley, and connect to the network wired trolley wirelessly. Secondly, we have pioneered the development of a Learning Hub for Schools based on the tools aggregated under the Google Apps for Education banner. We are hosting the first 2 open access pilot courses in the UK for these softwares this coming weekend, and our service based at http://www.clairescourt.net will provide a whole virtual school domain for pupils and staff, up in the Cloud. our Year 6 pupils found in their trial last year, the tools allow for effective collaboration on projects, presentations and publications. 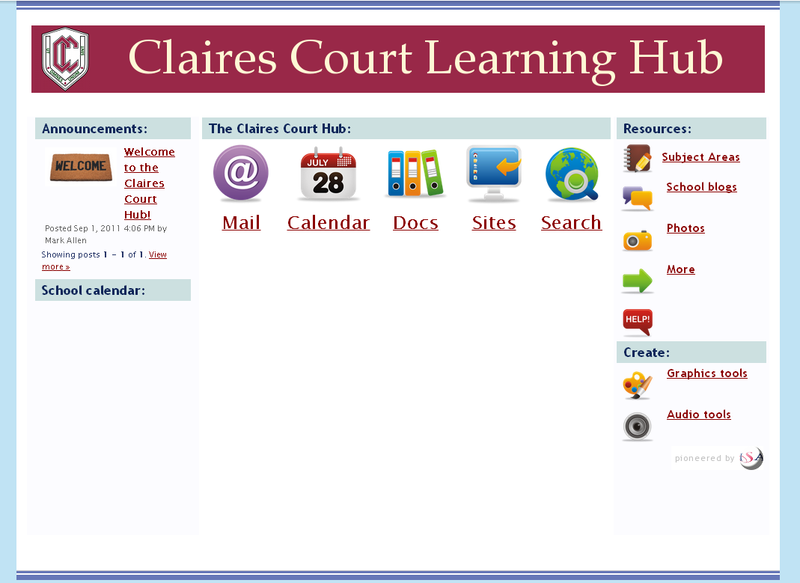 The Claires Court Hub will also provide unprecedented access between teachers and pupils should we close for any reason. Families won’t need to worry about downloading any software locally at home; providing they have access to the Internet, not only can they access documents and notices, but they also have access to the softwares needed to edit or create anew. Each Hub member has loads of private storage space for files, plus links through to the other services the school provides, such as Taecanet Springboard and MyMaths. During the next few months, the 6 pioneer schools in the country using this service will no doubt grow, share experiences and benefit from all the benefits of being in a large Google supported network. You can find out more about Google Apps for Education here – http://www.google.com/apps/intl/en/edu/ – and if you want to take part in one of our 7 training events this Autumn, just let me know.